For the second day of cooking with Chickpea, I made these stuffed chana puffs. These make a great evening snack. You can make the channa much ahead and knead the dough in the morning. All you need is these things ready for you make a delicious evening snack. The puffs don’t stay very crispy for long, so it’s best to serve them right away. And these are not your regular puffs, in terms of having so many layers. But the layer is crispy and tastes great with chole. I have been cooking with Kabuli channa so much that everybody at home are puzzled! No wonder, then ended up tasting different recipes. 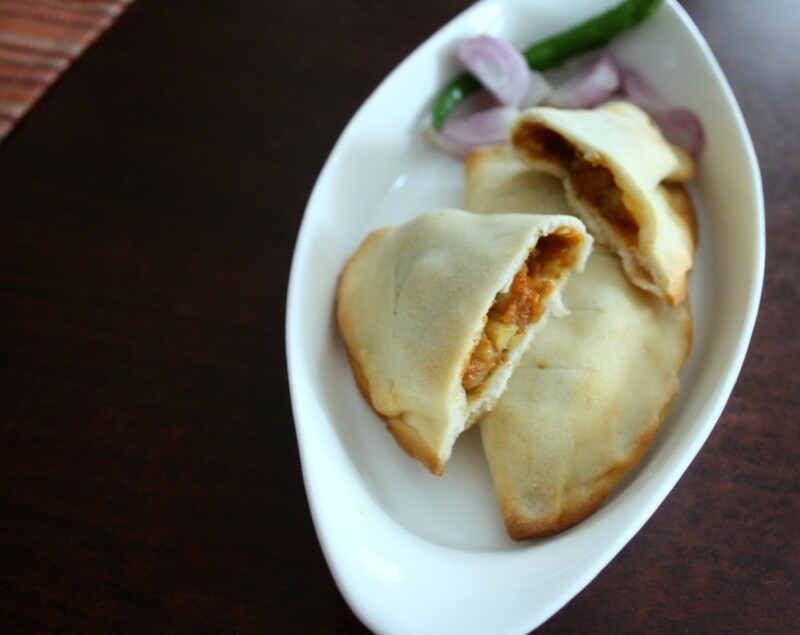 These can also be called Calzone with Indian Style Chana filling. 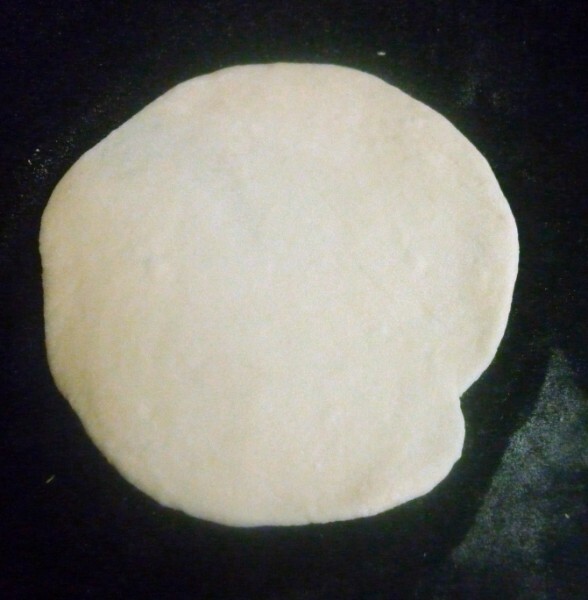 The dough is very much the pizza dough and can be made this way. 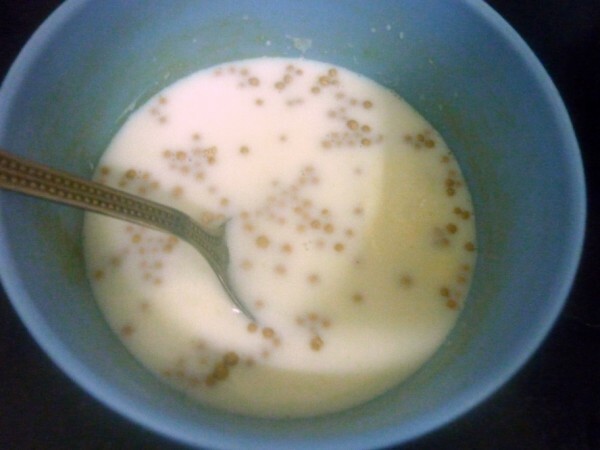 In a lukewarm milk, mix in the yeast and sugar. Cover with lid. 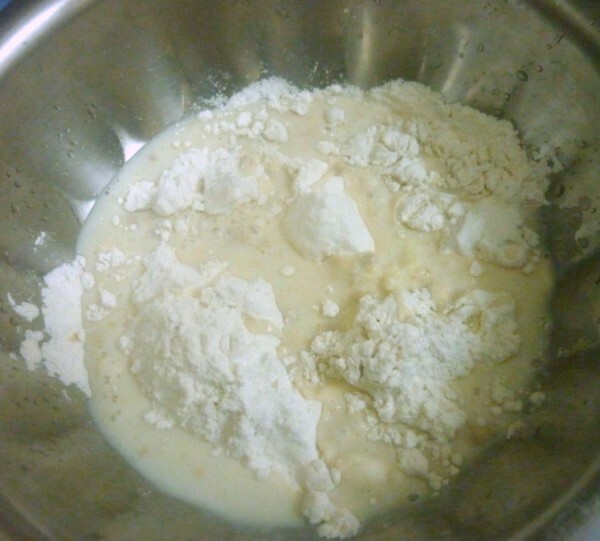 Once the yeast dissolves, mix this to the flour and knead to a soft dough. Add 1 tsp ghee and knead well. Cover with a wet muslin cloth and keep it aside. Divide into equal parts and roll out into small circles. Wash and soak the Kabuli channa overnight. Change water couple of times, in a pressure cooker take the chana and cook till soft. Heat the oil in a non stick pan, add the cloves, cinnamon, bay leaves, cumin seeds and onions and fry until the onions are light brown in colour. Add the garlic paste, ginger, green chillies, tomatoes and cook for 2 minutes. Add salt and cook till the tomatoes are soft. Add the pomegranate seed powder, turmeric powder, chana masala, coriander-cumin seed powder, cook for 2 minutes. Add the Kabuli chana and cook for 5 minutes. Mash some slightly while cooking. Arrange the puffs on a large greased baking tray leaving a little room between each puff. 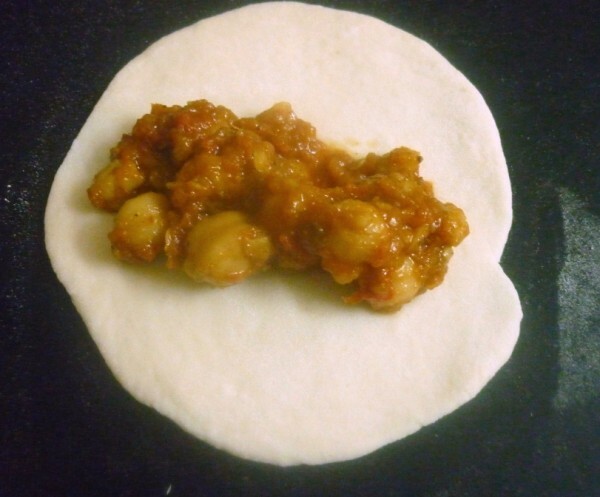 Place 1 tablespoon of chole in center of each puff and cover from one side. Press very well. Leave the tray in a closed cupboard for 20 minutes. Preheat the oven at 185 Deg C. Then bake these puffs for 10 mins. Then reduce the temp to 150 deg C and bake for 5 more mins. 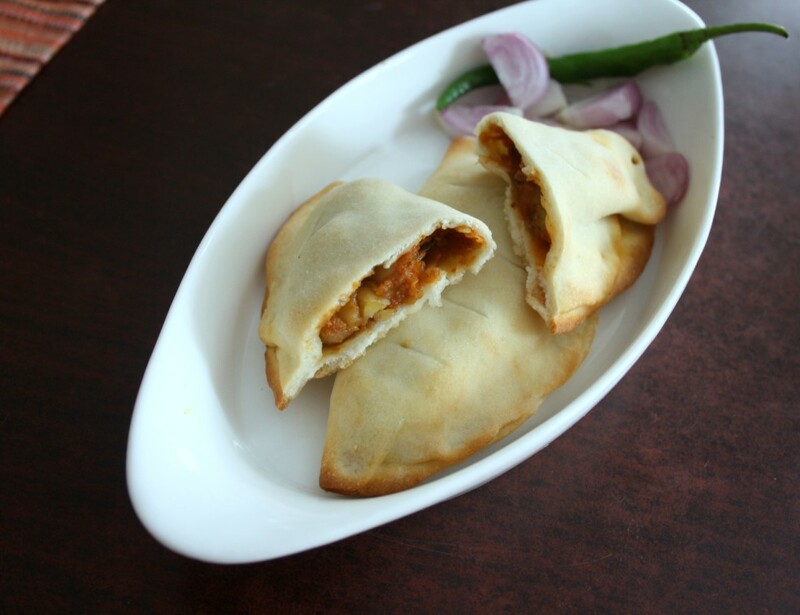 That's a tasty stuffing.. Never taste Calzone..
calzone with chole filling looks yummy and am sure it serves as a great tea time snack. 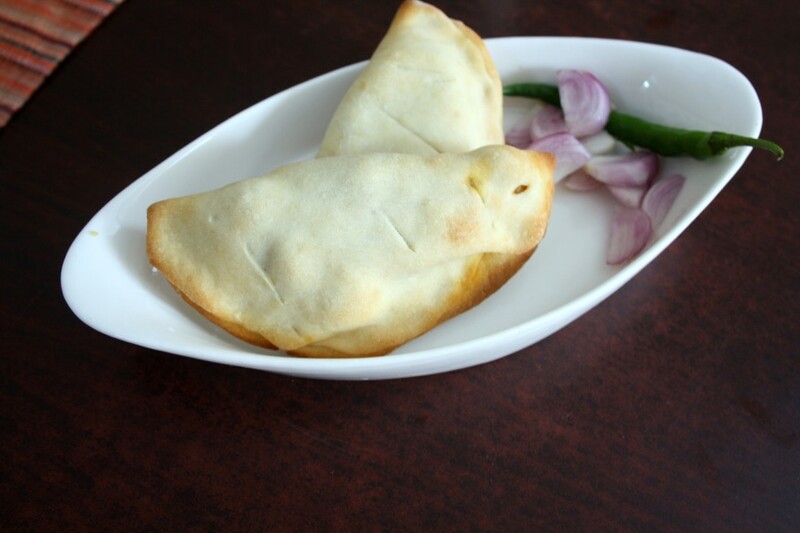 Delicious stuffing, calzone looks prefect and will definitely satisfy my tastebuds. love calzones!!! so versatile and delicious!!! i think them as tawa done or oven done samosas!!! nicely done valli!! Calzones look awesome. I need to try adding pomegranate seeds for chole next time. Thanks for adding my calzone link Valli. Indianized Italian treat.. looks delicious.